lots of issues with my laptop and also posting pictures...this is a test with a picture from Wed.
First post of this same picture yesterday was to tiny and does not enlarge when clicked on..Now this post same picture is to big...I give up ....using imgur tried everything... can anybody using imgur let me know how do get a normal sized picture onto ice shanty ? Great picture and limit Choo Choo. I was out Wednesday from 11 am until dark. Nice day but could not find hungry willing fish. If folks are out today and having trouble finding active eyes you might want to try shallower water. 17 to 24 ft is where I should have focused instead of the 28 to 34 ft range. People I talked to reported better luck shallow. I am done for this season. Good luck. Nice work on the fish fellas!! Good luck to anybody who gets out for the last hurrah on the eyes today!! Could use a spot for walleye instead of perch. You’ve had a couple slow days Freddie....they’ll pay if they show up tomorrow!  See you in the morning! Great pics and reports everyone! It has been a great season. Nice work on the perch guys!!! I had a nice last day to the walleye season...2 shorts, 2 nice keepers, and 2 lost on the way up with the pressure on for that third fish. Oh well, better than catching one or none. Not a lot of marks, and very moody fish that hit super light. beautiful weather. I fished from 2 to about dark south shore again. Caught a keeper at 2:30 and did not land my second keeper until maybe close to six. Started in 17 fow, made 2 moves searching with nada, then ended the season back in Wednesdays holes in 17fow gentle slope. 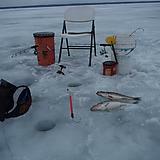 Looking forward to May .....and next Eye ice season ! Only trip out wasn't great but didnt go home empty handed either. Went from 7am -2pm out of Lewis. Started in 17' and didnt mark a fish but every other move out to 28' marked and caught fish. Same story as others - a ton of lookers and few biters. Ended up with one keeper Waldo and a couple 10" perch. Nice day and was set up before the one rain shower passed through. Lots of water on top but measured 16" of ice half white half black. At least it’s back below freezing now.